I interviewed at about three different charter schools this summer. All of the interviews took place in late late August or (in the last case) mid September. Lots of vacancies on their websites. 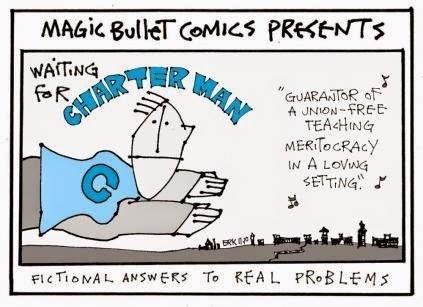 It appears that teachers peace out of charter schools quickly. The first school I interviewed at was recently in the news for calling ACS if the parents picked up their kids late. I don’t really care if they read this, as it seems like they interviewed so many people I doubt they remember who I am. The second charter school I interviewed was in a small, dingy building that looked like it had become a garbage dump over the summer. Junk everywhere. Not books, just junk. Empty boxes, old computers, stuff piled on top of old stuff piled on top of older stuff. Forget about the lottery — I saw several parents walk in with their kids. The lady in the office gave them an application and voila! They were enrolled. The interviewers themselves were fairly professional — two assistant principals who said that the charter school was doing poorly in state tests and needed to improve. I didn’t get the position, but I saw a few weeks later on the website that two assistant principal positions were now open. The AP’s who interviewed me had peaced out at the end of the summer. The third charter school was a place where I had put in for the job in July. Heard nothing back, assumed they weren’t interested. In mid-September I got a phone call. “Can you come in for a demo lesson?” I did a little research online and saw that the highly touted principal of that school had also suddenly peaced out at the end of the 2013/14 school year. The school is in one of the roughest neighborhoods of NYC — imagine a place where all the delis have bullet-proof windows and it’s 9:00 in the morning and people are wandering around the streets in some kind of drug/alcohol stupor. The building itself is very nice though, and built in the same style of the Harlem Children Zone building. Maybe they had the same architect? The lady who interviewed me said that they ‘really needed ____ teachers’ as they hadn’t had teachers in my subject area in, well, a long time. I did my demo lesson, and then was led around a tour of the school. They showed me the “student lab,” except it looked like it had been converted into a janitor’s closet because no students had actually stepped foot inside the lab in forever. I really didn’t want the job so I asked the interviewer, “I saw on the website that all the teachers only have 10 month contracts. Does that mean they are let go at the end of the 10 months?” The interviewer paused, and said, “Well, it doesn’t necessarily need to happen that way …” She then mumbled something about teachers being “accountable” under that system because they knew their contracts wouldn’t be renewed otherwise. I didn’t say anything but I kind of thought that the opposite might happen: if teachers know that their contracts aren’t likely to be renewed at the end of 10 months, won’t they peace out? Everyone talks about Success Academy and KIPP and the wonders they achieve. The charter schools I interviewed at were all small, rather depressing places in which student achievement was no better than the average public school and in some cases worse. Turnover is extremely high — you can probably walk into any one of them and find vacancies at any time in the school year. I actually can’t think of a single reason anyone would want to work in one of these places. And that, in short, is my summer charter school tour.